On Sunday 3rd May the Oxford Saints travelled to take on their nearest rival, the Swindon Storm. Both teams were riding high following big wins in week 2. 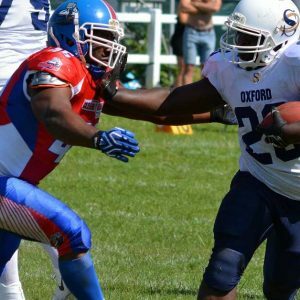 Swindon took down Torbay 59-22 whilst Oxford pulled off a comeback win of the decade by narrowly beating the Bristol Apache 35-34. The Saints last met the Storm in the 2013 regular season where a closely fought contest ended with a Swindon victory in the final minutes of the game. Looking to return the favour this year, confidence in Oxford was high. As both teams went through their pre-game warm-ups, dark clouds descended and the fitting sound of thunder was rumbling. 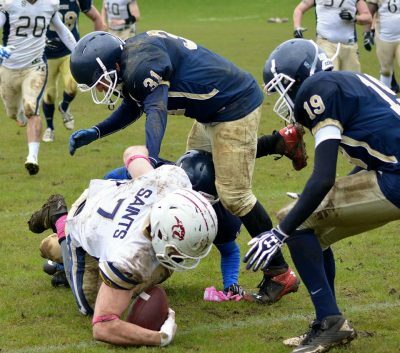 Under torrential rain and a field coated in mud, the Saints received the kickoff and the offense went to work. Quarterback Ben Denton led a strong opening drive as Oxford moved the ball against the Swindon defense with relative ease. Strong running from Kev Brooks and Mike Oluwole took the Saints 50 yards downfield but were unable to punch into the endzone on 4th down from the 6 yard line. Swindon’s offense took over and put together a strong drive of their own. The Storm had a simple but highly effective gameplan which saw them run the ball nearly every play. 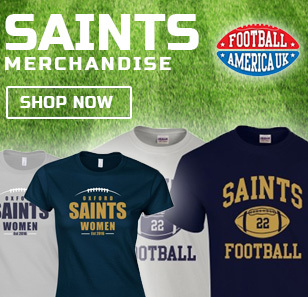 With impressive blocking by their fullback and the ability for their quarterback Dan Thorne to break out and pick up big yards, the Saints struggled to find an answer. A 78 yard drive was capped off with a touchdown but the extra point kick was blocked. 6-0 Swindon. Looking to test the Swindon defense in the air, Denton attempted a pass on the next drive which was intercepted by the Storm and returned to the 43 yard line. After 7 plays Swindon charged into the endzone again for another 6 points. The extra point attempt was again blocked and the home team took a early 12-0 lead. With plenty of time still to go in the first half, the Saints kept their heads high. The previous week against Bristol, Oxford were 28-6 down at half time and still brought back the win. Denton led the offense back out onto the field in just his 3rd regular season game as a quarterback. 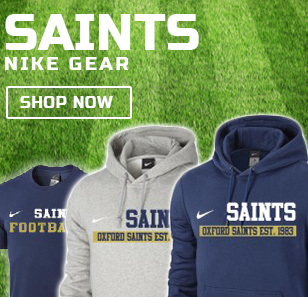 The Saints picked up 26 yards against the Storm but a fumbled ball rolled to the ground and a Swindon player promptly dived on top to recover it. 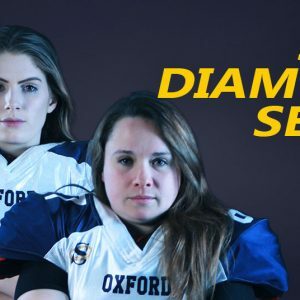 For the first time of the day, Oxford’s defense held strong and forced Swindon to punt the ball away, robbing them of the chance to capitalise on the fumbled ball. 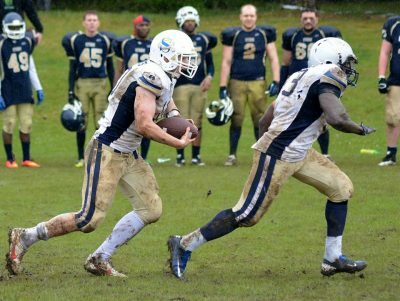 The rest of the first half saw Oxford continuing to struggle to move the ball on offense and two further interceptions led to another Swindon rushing touchdown and a successful extra point attempt. As halftime approached, the Saints were 19-0 down. As the rain continued to pour down, the second half got underway in a similar fashion to how the first half ended. In just one play, Swindon’s runningback break outside for a huge 60 yard run untouched into the endzone. Soon after the hosts would add on another touchdown drive and complete the extra point attempt to take a 32-0 lead. 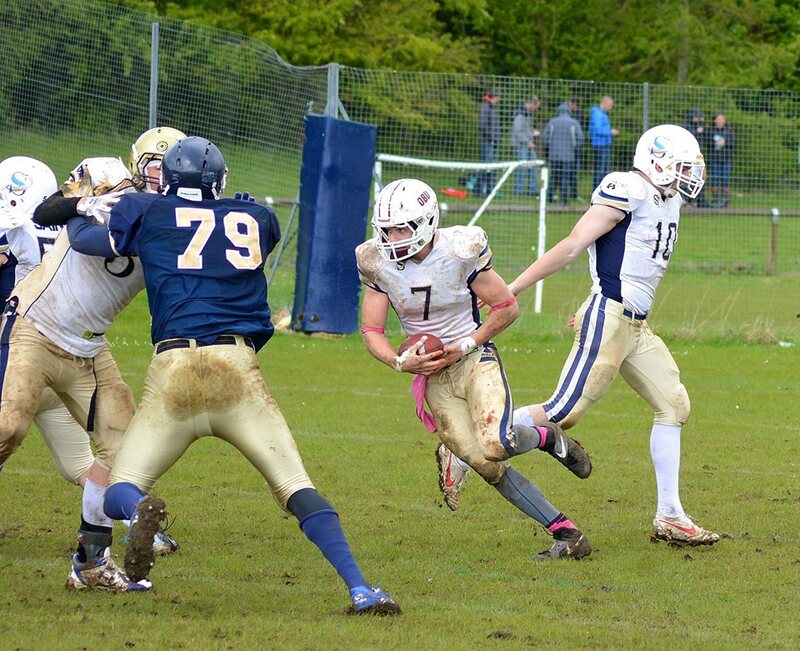 Late in the 3rd quarter, Oxford were finding their usual form and began moving the ball against the Swindon defense. Hard running by James Walter capped off a 13 play 50 yard drive with a touchdown run. A two point conversion attempt by James Walter himself was also successful, 32-8 Swindon. Although the offense had finally made their mark, big problems continued to plague the Saints defense. Going into the 4th quarter, Swindon charged into the endzone again after just 5 plays and added on another score. The Saints answered back with another strong drive leading to James Walter smashing into the endzone for his 2nd touchdown of the day. A two point conversion attempt was successful as tight-end Rich Bloomer caught the pass, bringing the score to 38-16 Swindon. Despite the two scores from Walter, the game was already over as Swindon continued to run against the Saints defense with minimal resistance. The Storm would add another two rushing touchdowns onto the scoreboard, to bring a dominating 50-16 win to an end. 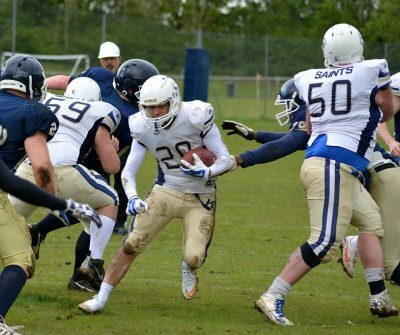 Although both teams obtained the same amount of first downs (19 for Swindon, 18 for Oxford), it was the Storm’s ability to pull off big runs and the Saints inability to stop them which tipped the balance. 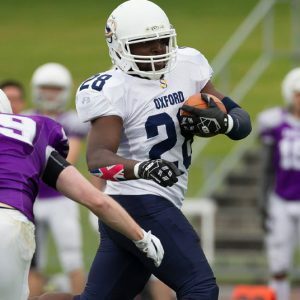 Oxford is well known for it’s strong running game, but the Storm ended with a whopping 477 rushing yards compared to Oxford’s 231, which in itself would be considered solid if you didn’t have to compare it to Swindon’s achievement. 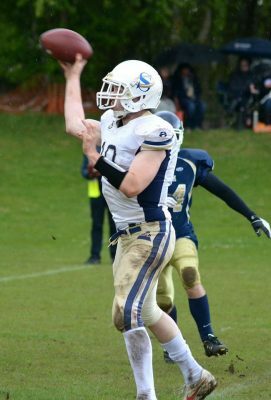 Swindon’s quarterback Dan Thorne picked up three touchdowns on the ground, after coming off an equally impressive performance last week against the Torbay Trojans in which he scored several times himself. Oxford will next meet Swindon on 5th July. The Saints now have a week to prepare for the next contest, when the Cornish Sharks make the long trip up to Oxford on Sunday 17th May. 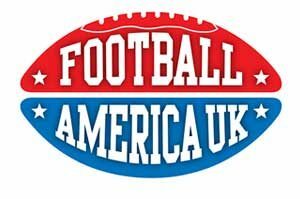 It takes a lot of work behind the scenes to run a successful American Football club. We are constantly looking for passionate individuals to join us and help put on a great show! 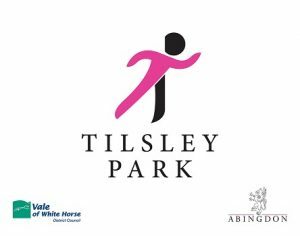 We have a range of tasks available on the sideline including general assistants, ball boys, camera operators and chain crew. 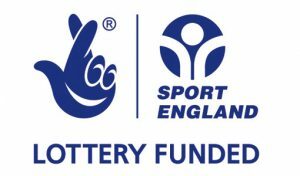 If you want to be part of a exciting sports team but playing isn’t for you, why not join our game day crew instead? Send a email to [email protected] and we will happily discuss all the options available! Here are the first few photos from the day. We greatly appreciated having several talented photographers on the sidelines and we look forward to seeing more of their work over the season. If you were at the game and have any photos you wish to share, email them to us at [email protected]. We’ll publish our favourites online and credit you as the photographer. Be sure to check out our facebook page for further photos as we get them! 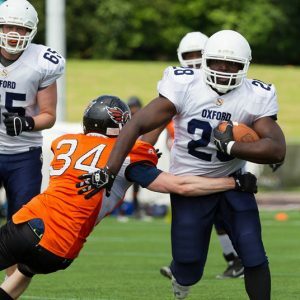 ← NFL Draft – Who would the Oxford Saints pick?